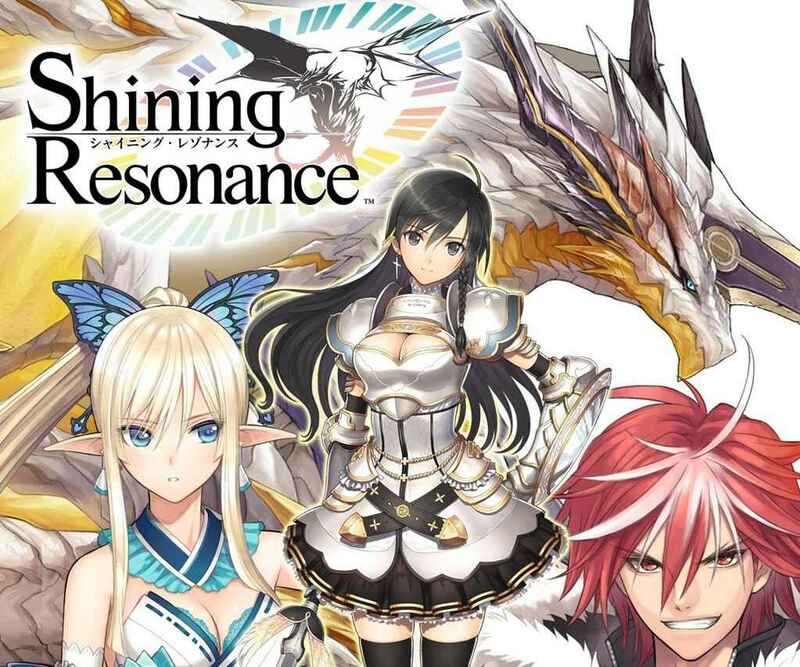 Shining Resonance Refrain is a remaster of the latest title in the Shining franchise. 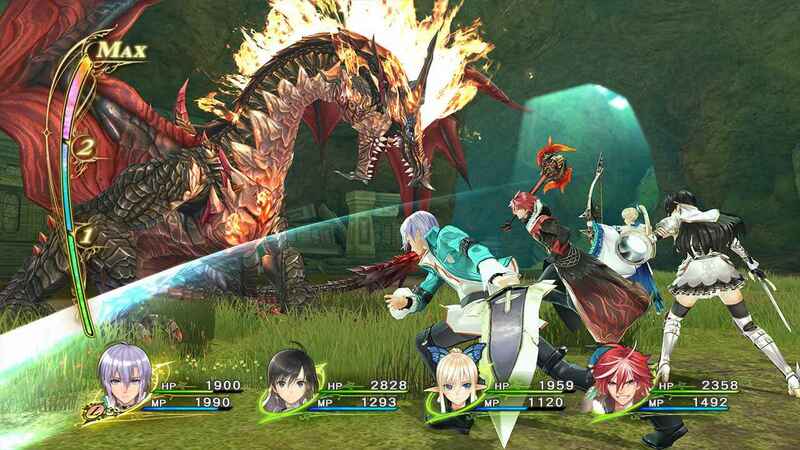 Never released outside of Japan, Shining Resonance released back on the PlayStation 3 and the remaster has finally got a western release. The question is: was it the wait worth it? Dragons take a central role in Refrain – not only do you battle them but Yuma has the power to transform into one. Refrain tells the story of Yuma: a young man who is imprisoned by “The Empire.” The Kingdom of Astoria, who are at war with the Empire, mount a rescue operation to free Yuma. The princess Sonia leads an assault on the prison and frees Yuma who is revealed to harbor the soul of the Divine Dragon. The Divine Dragon is the most power of its kind and can lay ruin to entire continents. Learning of Astoria’s plight and it being the last remaining nation opposing the Empire, Yuma decides to lend his aid to the kingdom and bring down the Empire. Refrain boasts an impressive translation. Almost every scene is dubbed and the written translation is almost perfect. For a game that was once a Japanese exclusive title, Sega really kicked up the translation into high gear. The voice work is also exceptional. Every voice actor did a great job and played their character perfectly. Anime fans will definitely recognize a lot of the actors here. A great addition to Refrain is a second campaign that follows the story of the Empire. It’s a great little addition that explores even more of the story and explores your enemies motives. This mode wasn’t available in the original PS3 release. When it comes to the story, it moves at a decent pace but there are a lot of times where it just doesn’t go anywhere. For a story where two nations are at war, I never felt like there was any real conflict going on. People would go about their lives and I would never hear about any big struggles going on. There is also a lot of downtime between big story missions and small boring individual character story missions.that don’t really do much of anything for the main conflict of the story. Not even when it comes to Yuma and his mysterious dragon powers. Which seems to constantly take a back seat in the story. Refrain isn’t like most JRPG titles. Magna is the only town that’s available to explore. As this is the only town not controlled by the Empire. Magna is a beoutfull city with some nice landscapes to look at and even go on dates. Refrain features an entire dating game which you can partake with the various ladies in your party. While in town, you can ask one of your companions to spend some time with. After a few nights of hanging out some of them will ask you to go on dates. These companion moments are a great way to explore the personalities of your party members and learn more about their backstory. Side quests come in all shapes and sizes in Magna as the citizens will constantly ask for your help with collecting items and killing monsters. There are plenty of these quests to take on but the problem is that a lot of them repeat. After completing a quest and sleeping at an Inn – or going out of the town and coming back – some of these quests start again with the same objective and reward. Transform into the Shining Dragon and lay waste to your enemies. It’s a big turn off to do the same quests over and over again but it’s always good to grab the quests. Even though you aren’t pursuing it, chances are you’ll complete them as you play through the game. Shops, crafting, and weapon tuning are also located in towns. Crafting is simple, find the materials and craft until your hearts content. Items are easy to craft but other things like gems are much harder. Gems can be equipped on each character that will increase their stats or make them immune to some aliments. Think of them like accessories in other RPGs. Weapon tuning on the other hand is quite interesting. Weapons take the forms of musical instruments like guitars and trumpets. Each weapon has its own unique stats but also a unique passive ability like automatically blocking attacks during battle and increased weapon magic damage. Weapons get stronger the more you use them in battle and increase their stats. The weapons take up all of a characters stats. Defense, magic damage, and attack are all tied to your weapons leveling them up is the only way to increase your stats which means lots and lots of combat. You can also level up weapons with stones from monster drops and completing side quests. The world of Shining Resonance is one giant island. Exploring the world can be fun and moving around the different regions allows you to encounter the various monsters in the world. The further I progressed in the world the longer it took to get to each location. It became a chore to constantly have to travel to a location and then have to travel back to town for a few scenes and then head back out to the same location. A fast travel mechanic could have helped a lot. 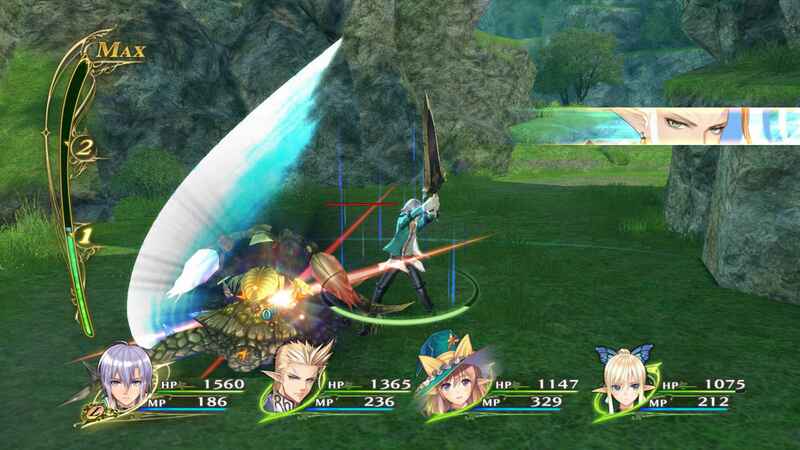 Refrain uses an action combat system closely resembling the Tales franchise. Stringing combos together is the core concept of combat. Adding to simply mashing the attack button each character has a break ability. Breaking an enemies guard allows you to damage enemies while ignoring their defense. Special abilities or Actions as they’re called are the unique skills each character gets such as healing and pulling of magic attacks. These skills are mapped to the four face buttons of the controller and can be switched out with new Actions as they are unlocked as you progress. There are plenty of Actions for each character and I constantly found myself trying to decide which ones were important enough for which fight. Thankfully you can even switch out your Actions during combat. I should also mention that for a game that prominently features music through its weapons the characters use, the music isn’t that great. It’s actually one of the weakest points of the game and most of the time the characters instruments don’t even make the noises of the instruments they’re using. It doesn’t hurt the game that much but it is something I noticed rather early. Enemies level up throughout the campaign and ones encountered will either change or different versions of the same one will appear. 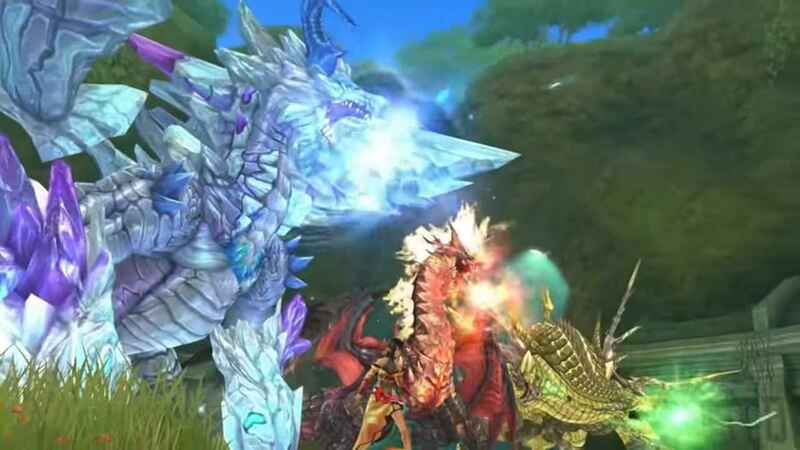 Weather also changes throughout the land and different weather brings out different types of monsters and some quests require these different weather conditions are. The Shinning franchise is one of the oldest franchises around and it’s definitely one of my favorites. It’s been a long time since I played a new game in the franchise and Refrain was a good return for me. It’s not the best game in the franchise but it’s definitely not the worst. Shining Resonance Refrain review code provided by SEGA.